New iPhone software for your car functions as "Skidometer" We are looking for Beta Testers. Program ends Feb 1st, 2009 in just a few days. Visit the Total Traction site NOW! 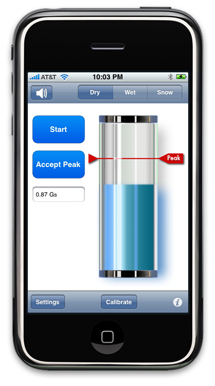 Total Traction is a new iPhone and iPod Touch application for automotive enthusiasts. It uses the built in accelerometers in your phone to continuously estimate how close your car is to loosing traction, or skidding. Like a Tachometer indicates when redline is approached, Total Traction displays an approaching skid. 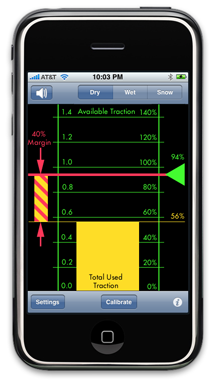 This information can be presented as a simple on screen bar graph representing the percent of available traction used, or a more detailed view that displays both total traction available, traction used, and their relationship to each other. In addition to visual cues, the user can enable continuously variable audio tones that start at a certain threshold and increase in urgency as loss of traction is approached. You know you get more cornering force on a banked turn, but how much more? You know driving in rain or snow requires a lighter touch, but how can you practice on dry roads? You have learned you have less braking power going down a hill, but how much margin do you leave? You want better daily gas mileage, but what driving habits are costing you? You know you can't corner as hard in a climbing or descending turn (you knew that, right? ), but by how much? You've heard the complaints from the family about your whiplash driving style, but where should you improve? You know braking in a turn can cause a slide, but where is the limit? You have heard that entering a turn with a steady transition from braking to cornering is the best, but how well are you doing? Total Traction can give you the answers to these questions and more. Intuitively, in real time, and with safe, easy to understand feedback. Don't miss this opportunity to shape the features and functionality of this new iPhone and iPod Touch application for automotive enthusiasts. Beta slots are limited, so sign up today! Just follow the instructions below in the "Beta Test Program" link to get started with the application. Beta Testers will be given a free copy of the released app. The iPhone or iPod Touch can be mounted and calibrated in ANY orientation in the car for maximum flexibility. Use it lying flat in the coin tray, or mounted vertically or sideways on the dash. Put it on the sun visor for audio only mode, or fix it flat on top of the dash near the windscreen for a reflected heads up display at night. They all work equally well, and calibration can be achieved in seconds with just a single button push.